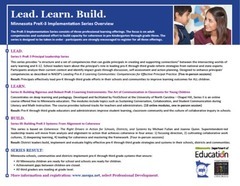 This page contains information and resources that will help you understand our view of implementing PreK-3 systems. The model above contains three main components (Core Elements, Framework Components, and Implementation Drivers) and two results (Population and Program). 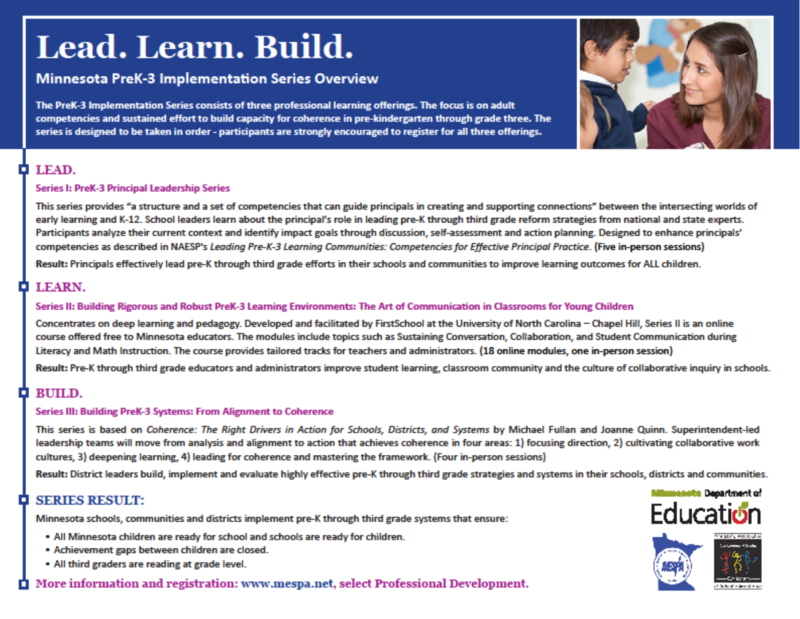 The model guides the development of our professional learning opportunities, and can also be used to guide the implementation of local PreK-3 systems. Throughout every level, the model is focused on building, developing, and supporting adult competencies. The knowledge, skills, and attitudes of all adults in the PreK-3 system are essential ingredients. Therefore, capacity-building is integrated into the model and necessary in all work. All PreK-3 capacity-building efforts should be systemic, integrated, and sustained. PreK-3 is not a educational fad or simply a strategy. Rather, it is a K-12 reform effort that involves creating and implementing a system. Ensure maximum achievement of all students by collaborating to continually improve leadership, teaching, and systems. 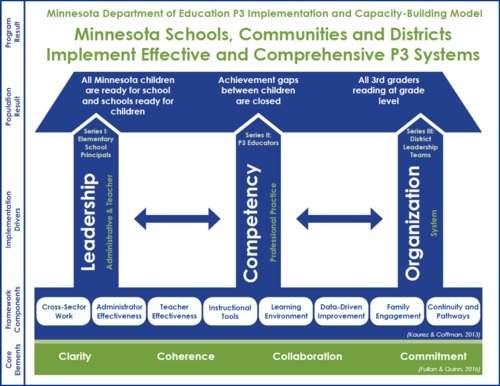 Design, collaborate, and provide high-quality professional learning opportunities that support the implementation and enhancement of PreK-3 systems in Minnesota schools, districts, and communities. The Core Elements are organizational conditions that are necessary for educational entities to successfully implement and sustain PreK-3rd Grade systems and initiatives. These elements help districts and communities create educational systems that are coherent and aligned with educational improvement goals (e.g., World's Best Workforce), sustained over time, and spread across the district and community. In our model, the Core Elements are broad and specific, and should be a primary focus in your organization. Explicitness and clarity need to go hand-in-hand. Alignment is a key component of PreK-3 work. Successful PreK-3 systems require constant attention to the process of alignment, from curricula to family engagement to the educational experiences of children. However, alignment alone is not enough, as alignment is something that is often conceptualized at the planning stage. Through alignment and other processes, our goal is to create coherent, comprehensive PreK-3 systems. PreK-3 systems cannot be implemented without collaboration. PreK-3 systems consist not only of people from different programs and grade levels within a school and district, but also of people from different programs and systems (e.g., families, child care, health care) within the community. Districts and communities that have implemented successful PreK-3 systems demonstrate strong, enduring commitment to the work. Because PreK-3 involves many parts in the educational system (and often other systems), it is essential that districts remain committed and steadfast. The framework elements are the eight buckets of The Framework for Planning, Implementing, and Evaluating PreK-3rd Grade Approaches (Kauerz & Coffman, 2013). See each of the framework elements for further information. The implementation drivers are based on implementation science. "Implementation Drivers are the key components of capacity and the functional infrastructure supports that enable a program’s success. The three categories of Implementation Drivers are Competency, Organization, and Leadership. From The National Implementation Research Network, FPG Child Development Institute, University of North Carolina, Chapel Hill. The model contains both program and population results. The goal of our work is that Minnesota schools, communities, and districts implement effective and comprehensive PreK-3 systems.